“Documents prove Lenine and Trotzky hired by Germans” was the New York Times’ front-page headline, Sept. 15, 1918. 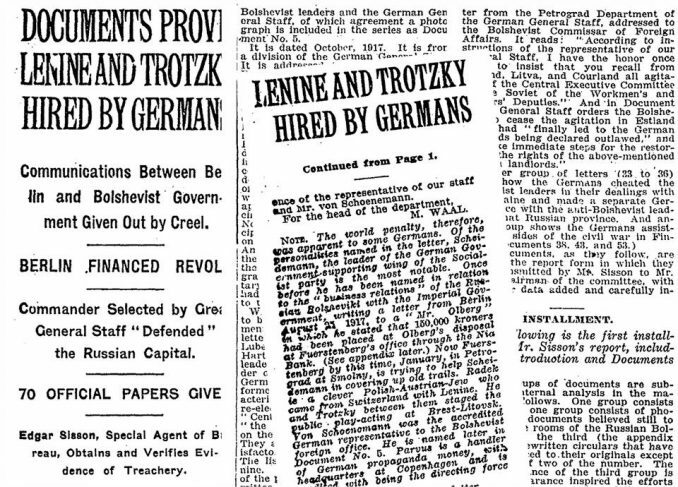 According to the Times, the socialist revolution, and its millions of people from many nationalities who rose up, was just a conspiracy hatched by the German Kaiser. That was “fake news” 98 years ago. Today’s version — just as phony — claims the current capitalist Russian government threw the U.S. presidential election to super-bigot Donald Trump. The 1918 big lie was based on 70 documents provided by U.S. government official Edgar Sisson. The “Sisson Documents,” supposedly originating from different locations, were almost all typed on the same typewriter. In the 1950s, retired U.S. Ambassador George Kennan — himself a Cold War architect — pronounced them forgeries. 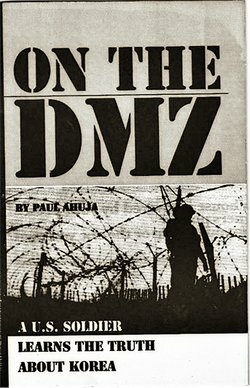 Decades before the documents were exposed as a fraud, the “fake news” was used by President Woodrow Wilson to justify sending troops to occupy revolutionary Russia. But that didn’t stop Seattle dockworkers from smashing crates of rifles going to former Czarist Admiral Kolchak, who threw suspected Bolsheviks into boilers in steam locomotives. And less than two months after the “Sisson Documents” were published, German workers and sailors — inspired by the Bolshevik Revolution — overthrew the Kaiser. The Russian Revolution gave birth to the Soviet Union that included people from more than 100 nationalities. The country’s socialist five-year plans industrialized the country and pioneered spaceflight. Before the revolution, the majority of people were illiterate. After, millions of students attended tuition-free universities with courses in dozens of languages. Nearly 27 million Soviet people died defeating Adolf Hitler. It was Soviet soldiers, belonging to what used to be known as the “Red Army,” who liberated Auschwitz. Black Liberation fighters in the U.S. such as Claude McKay, Langston Hughes, W.E.B. Du Bois, Claudia Jones and Paul Robeson were inspired by the Russian Revolution. Wall Street continued Hitler’s crusade to destroy the socialist system. The Pentagon spent at least $5.5 trillion on nuclear weapons aimed at the Soviet state, according to the Nuclear Threat Initiative. After 73 years of attacks from world capitalism, Soviet leaders capitulated in 1991. Socialist economic planning was overturned and capitalism was restored. The Soviet Union was broken up into 15 countries. Today Russia is a capitalist state with dozens of billionaires. But Russia continues to be independent politically, unlike several former Soviet republics that are neocolonies of U.S. imperialism. The Pentagon looks at Russia as 6 million square miles to be occupied like Afghanistan and Iraq. Now, in the aftermath of Trump’s victory, and a century after the Sisson Documents fiasco, the New York Times and Washington Post are claiming that Russian computer hackers intervened in the U.S. elections. A majority on the U.S. Supreme Court gutted the Voting Rights Act — not Russia. The leak revealed the truth about how the DNC sabotaged Bernie Sanders’ campaign and about Hillary Clinton’s secret speeches to Goldman Sachs bankers. That’s whistleblowing, just like the truth-telling carried out by courageous Chelsea Manning who was sent to prison for it. The “fake news” targeting Russia is a diversion from the struggle against Donald Trump’s bigotry. It’s an attack on the billionaire Klansman from the right, with the claim he’s “soft on Russia.” This, despite Trump nominating “Mad Dog” Gen. James Mattis, who sees Russia as a “world threat,” to head up the Pentagon. The onslaught of anti-Russia “news” comes from a capitalist class that wants to deflect the hatred people have for a system whose racist cops kill children, people of color, people with disabilities and, most recently in Bakersfield, Calif., an elderly Latino man carrying a crucifix. Don’t fall for the fake news! Our enemies are in the Pentagon and in corporate boardrooms — not in Moscow!